The Ozark Gateway regional tourism association will celebrate its 50th year of service to the state travel industry during the Leo Rainey Tourism Appreciation Banquet, Monday, June 6, at Arkansas State University’s Newport campus. The event is the annual recognition banquet for volunteers and tourism business leaders in Fulton, Independence, Izard, Jackson, Lawrence, Randolph, Sharp and Stone. All interested persons are welcome to attend, but tickets are limited and must be purchased in advance, according to executive director Cathy Drew. This year’s banquet will feature the entertainment of Alyse Eady, who was named Miss Arkansas on July 17, 2010, in Hot Springs and was the first runner up in the Miss America pageant last January. She is the 23-year old daughter of Lewis and Lady Eady of Fort Smith. First called the “Area Tourist Committee,” the Gateway tourism promotion group has always operated with volunteers representing each county. It has been a non-profit organization from its beginnings and was the second travel association recognized by the state Department of Parks and Tourism. Leo Rainey (1932-2004), a native of Conway County, was transferred to Batesville in the late 1950s to head a University of Arkansas-sponsored development program, established as a national pilot to help rural Americans. Rainey guided the formation of crafts guilds and festivals throughout north central Arkansas and helped create four of the original 12 regional tourist regions. In later years, Rainey’s pioneering work was recognized by the industry which presented him with the highest awards offered, including the Tourism Hall of Fame. The first tourism project in this area was to create a “Dogwood Drive” brochure. A total of 10,000 one-color “fliers” were printed for the 1962 spring season. To add to the wild dogwoods in the region, the tourism group ordered and planted almost 200,000 seedlings by 1964. Early leaders who served as chairman during those years were Bill Rosa of Mountain View, Y.M. Massey of Batesville, Carson Goings of Hardy, Vernon Vinson and Roscoe King, both of Batesville. Craig Ogilvie, the only surviving member of Rainey’s original team, designed the first Gateway brochures. He and Rainey made several trips to Memphis, where the first color tourism guide was printed in 1967. Ogilvie, who went on to a career in newspapering and 30 years with the state Tourism Division, has been an active part of Gateway since 1962, when he was 17. Ogilvie was inducted into the Arkansas Tourism Hall of Fame in 2009. In 1971, Jackson County joined, and the six-county organization was incorporated as the Ozark Gateway Tourist Council. It had 200 members with 60 members in Independence County. The first president of the new Gateway Council was Vernon Vinson, who owned the American Motor Inn at Batesville. Wilson Powell (1914-2003) was the first secretary/treasurer of the Gateway Board and held the position for over 25 years. Powell was the business manager and staff writer for the Batesville Guard, writing most of the Gateway features promoting the region. The annual “Wilson Powell Media Award” recognizes contributions to area tourism through public media. By 1973, Gateway was publishing 50,000 guide books each year and attended their first travel show in Memphis that year. During the Seventies, Gateway pioneered several new promotions, including the state’s first travelogue television shows for out-of-state markets. Always the membership leader among the regional associations, Gateway boasted over 300 members during the late 1970s. This was due mostly to the late Thomas A. Biggs (1897-1984), a Sharp County native who retired in Batesville. Biggs always sold over 100 memberships in Independence County, and traveled to other counties to help with their sales. Gateway honors his memory with the annual “Tom Biggs Award” for outstanding service to tourism. When the Delta Byways Association was established in the early 1980s, Lawrence and Randolph petitioned and were accepted into the Ozark Gateway, expanding the region to the present eight counties. This year, Gateway published 105,000 full-color guide books for free distribution to anyone wanting area travel information. The current president of the association is Bob Pest of Locust Grove. 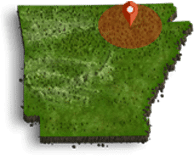 For more information about the region, a free guide, or the upcoming banquet, contact the regional office at (870) 793-9316 or toll-free at1-800-264-0316, or visit www.ozarkgateway.com.